Remember when I told you about wine made in a paper bottles? Well, I drank it for the first time this weekend. Verdict: meh on the wine, cool on the packaging. 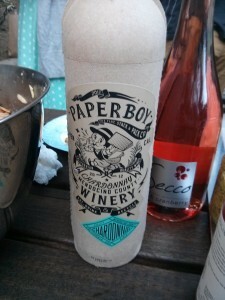 I had the 2012 Paperboy Chardonnay at a picnic on Sunday at the Hollywood Bowl, one of my fave LA summer activities. A friend who is a big fan of Chardonnay brought it along. The wine doesn’t have much going on. It smells like grape juice and it tastes like alcoholic grape juice. It’s a tart chardonnay and absent, in my mind, was the iconic butteryness in most Chards. It reminded me of Franzia. Now about the actual good stuff: the packaging. It’s made by a U.K company called GreenBottle and the eco-friendly company’s first U.S. partner is California-based Truett-Hurst. Much like boxed wines, paper bottles are lined with a plastic bladder to hold the liquid. Paperboy is sold at Safeway stores. When to drink: When you’re looking to bring a novelty along to a party. Not recommended to drink over a nice dinner at home.